A night of information gathering by attendees at a recent Singapore Airlines (SQ) event turned into something much bigger for meetings consultant Alex Frias of International Conference Services of Vancouver. Frias was on the receiving end of a randomly drawn prize package that includes return flights to Singapore on Singapore Airlines with a space-available upgrade designation. He will be onboard one of the new flights that will be departing from Seattle (SEA) as of Sept. 3, when the new non-stop service to Singapore begins. The package also includes a three-night stay at the Shangri-La Hotel, as well as spending money. SQ will operate an A350-900 aircraft with three cabin classes, including economy, premium economy and business, on the Seattle route. The premium economy seats have a roomy 38-inch pitch, while economy seating has 32-inch of pitch. There will be a total of 243 seats, including 187 in economy class, 24 premium economy seats and 42 business class seats. Singapore Airlines will operate three flights per week on the new route, but plans to increase the frequency of the service to four nights per week as of October. Singapore Airlines currently operates 53 flights per week to the US cities of Houston, Los Angeles, New York (both JFK and Newark) and San Francisco – including 27 non-stop flights to Singapore. With the introduction of the new Seattle flights next year, the total US frequency will increase to 57 flights per week. 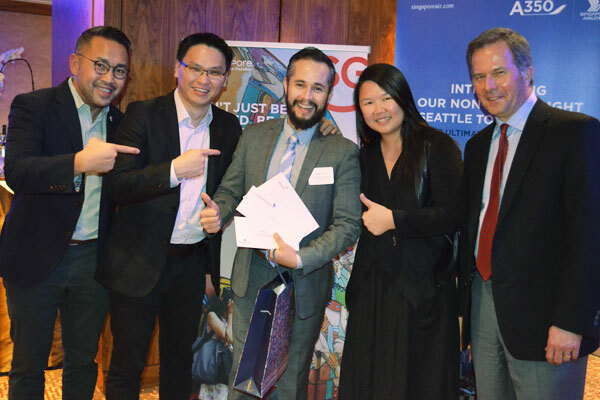 Pictured, Alex Frias of International Conference Services (ICS) in Vancouver (c) was the winner of a return flight to Singapore from Seattle at a recent Singapore Airlines event in Vancouver. He was joined by (l-r) Ambrose Tham, MICE specialist for the Singapore Exhibition & Convention Bureau; Tim Lee, VP for Singapore Airlines for the western USA; Magdeline Zee, passenger development manager for Changi Airport in Singapore; and Les Kovacs, SQ sales manager for Canada.